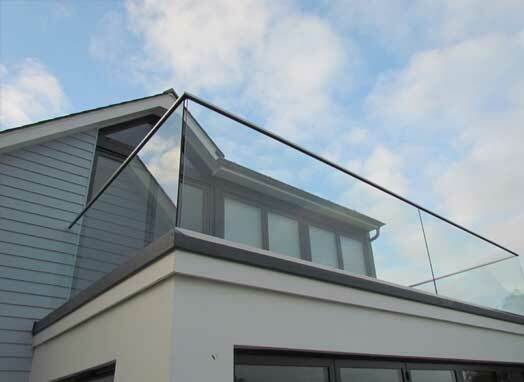 Introducing The New Easy view ( Handrail ) Juliet Balcony System Comes With 10mm Clear Toughened Safety Glass As Standard. Incorporate Easy View juliet balcony into your projects and enhance both the safety and appearance of façades with floor to ceiling windows. The fully transparent glass structure of this Juliet balcony system lets maximum light into a room and makes for uninterrupted views. Easy View juliet balcony is a stylish addition to any façade. For an additional touch of elegance, go for an aluminium cap rail and add lights to the underside. Select your preferred colour temperature to create just the right atmosphere, then simply push the light units into place with a click. *When bought as a full system ex. VAT and delivery. Additional costs may apply. Prices are subject to change, please contact us for further information. 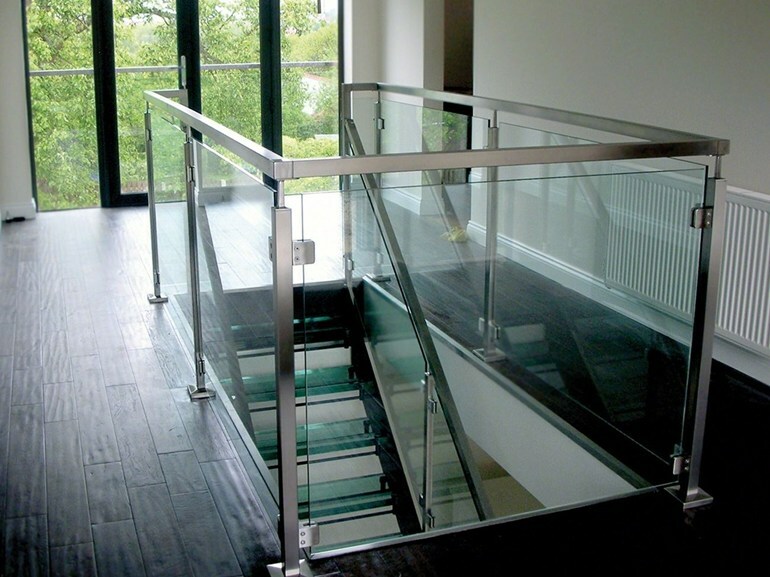 "As you can see the handrail is on,it fitted perfectly.Your customer service is excellent and I will definitely recommend your firm to anybody I know who is thinking of purchasing your products.Once again many thanks for what you did and the superb service you gave." "Just a quick note to say how pleased I am with the balustrade I have recently received. The service has been first class, the product looks great & the quality of finish is excellent. Delivery was prompt and very helpful. It's not often I get the opportunity these days to complement a company on its service, but on this occasion it is well deserved. 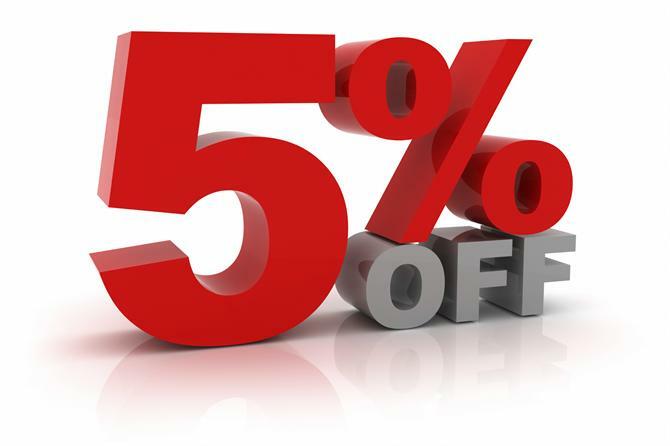 I will certainly recommend you to anyone I know who is considering purchasing a similar product." Chris, Chris & LeonJust a quick note to say what a pleasure it has been to deal with your business - from the first phone call through to delivery you have all been very helpful, provided sound advice and most importantly delivered a great product quickly. I will be sure to recommend your business to family and friends in the future. Thank you." Our frameless system 1 is mostly used for a high class seamless look that is fully integrated into your surface surroundings.If you’re building a patio, deck or balcony you can’t go wrong with the fully frameless channel system for a superior high-quality, designer-look and great for an entertaining area. This fencing system is fastened onto the surface so there are no posts to block your view. You can use this system on internal gallery landing's, balconies and even decking area's, If you do not want the top rail then you must use 19.5mm clear toughened / laminated safety glass otherwise 15mm clear toughened glass is standard. 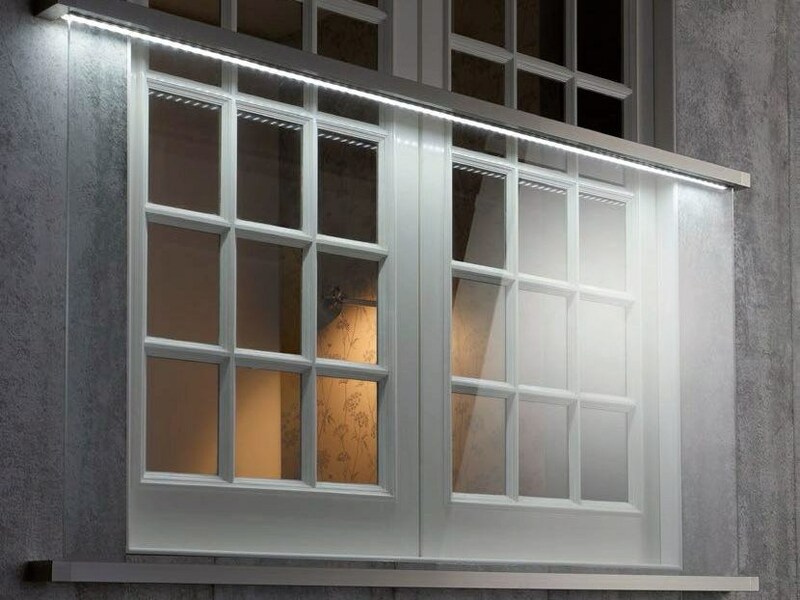 Our post system 2 comes with 10mm clear toughened glass as standard along with a 42.4mm diameter handrail in satin or mirror finish 304 or 316 grade stainless steel. It is available in 42.4mm diameter or 48.3mm diameter posts with matching top rail. It can be used for a variety of installation’s including decking areas, swimming pool surrounds or balconies and terrace’s. 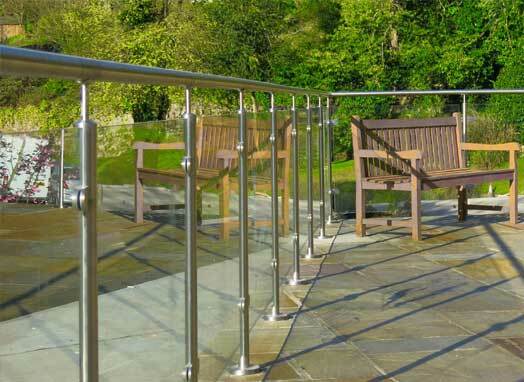 Our stainless steel system 3 glass balustrade is a simple yet effective design, perfect for decking area's, balconies or raised garden area creating a feeling of safety when enjoying the outdoor space. Due to its well-known durability it is the most commonly used railing system for area's with greater pedestrian traffic. 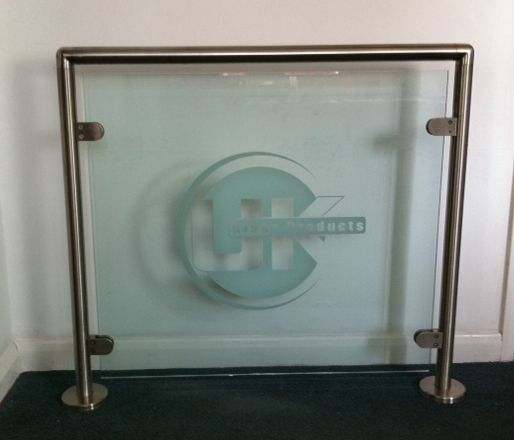 Available in a variety of tinted and frosted glass it is the most popular choice of customer's for an effective privacy screen solution, this comes in a satin finish or mirror finish if you live near the sea, have a hot tub or swimming pool. Our square system 4 is beautifully finished in satin or mirror finished stainless steel in 304 or 316 grade, comes with handrail as standard and is a 40 x 40mm box section, the system has a unique quality and feel about it makes any space look fantastic. This system really is a step above the rest, and made with prestigious craftsmanship. 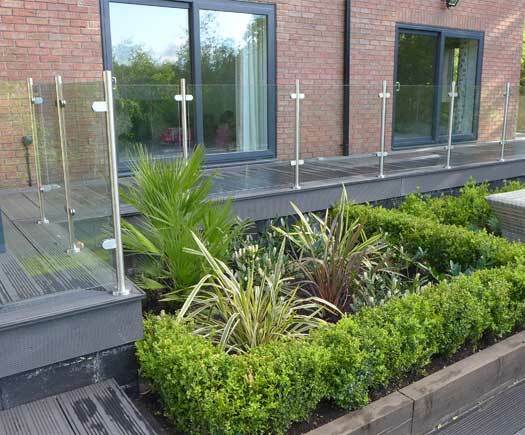 Our stainless steel semi frameless system 5 glass balustrade is a very affordable design for any garden balustrade without compromising on quality and safety. 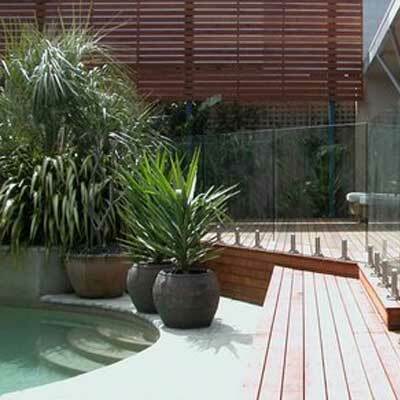 A very low maintenance solution, it will allow you to enjoy your outdoor space while still enjoying your surroundings thanks to an stylish stainless steel post design that safely secures the glass panels in place without the need of a top handrail, this comes in a satin finish or mirror finish if you live near the sea, have a hot tub or swimming pool. The spigot system 6 comprises of 12mm clear toughened glass panels, along with heavy duty stainless steel 12 inch spigot’s which simply clamp onto the glass itself without the need for holes in the glass panels, made to an external height usually at 1100mm overall from floor level to top of glass. These are made bespoke to your needs and usually takes around 12-15 working days in total. © 2018 UK Glass. All rights reserved. Registered in the UK. WHEN YOU PAY BY BANK TRANSFER!